Pass cheese through a small grater. In deep ware mix raw eggs, the salt, grated cheese. To the received weight a thin stream add milk or cream, stirring slowly with a spoon or a mixer. Frying pan preliminary greased with sunflower-seed oil, warm up and lay green peas and the prepared mix. Put in an oven for 15-20 minutes to readiness. Ready tebese cut for the portion and in a hot kind submit to a table. 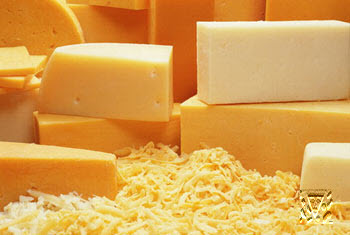 On 150 g cheese: 5 eggs, 1 glass of milk or cream, 4 tbsp of green peas, 3 tbsp of vegetable oil, salt. Cut red cabbage, add a few salt and knead hands before juice allocation. The boiled mushrooms cut. Small cut well washed out cucumbers and onions. All ingredients lay in deep ware and having added to taste of salt, sugar to sand, sour creams properly mixed. Ready salad we submit to a table in a salad dish. On 300 g red cabbage: 300 g mushrooms, 2 pickles, 1 onion, 200 g sour creams, granulated sugar, salt, greens.